Place the pink grapefruit juice in a small saute pan, and set over medium-high heat. Reduce the juice by 2/3 until you have about 4 tablespoons left, 4 to 5 minutes. Remove from the heat, let cool, and reserve until ready to use. To prepare the dish, set the grill on medium-high. Skewer each lobster tail, then brush with 2 tablespoons of the olive oil on the cut sides and season with 1/2 teaspoon of salt and 1/2 teaspoon Bayou Blast Creole Seasoning. Place the tails, cut side down on the grill, and cook for 3 minutes, rotate 45 degrees, and cook for an additional 3 minutes. Turn the lobsters over and cook for 2 to 3 minutes, or until just cooked through. Meanwhile, in a medium sized bowl, add the shallots and mustard, and use a small whisk to incorporate. Slowly drizzle in the reduced pink grapefruit juice and the Champagne vinegar. While continuing to whisk, add the remaining 1/2 cup olive oil in a thin, steady stream and lightly season with 1/4 teaspoon of salt and 1/4 teaspoon of white pepper. Add the chopped tarragon and whisk to combine. The vinaigrette can be made a few hours in advance. 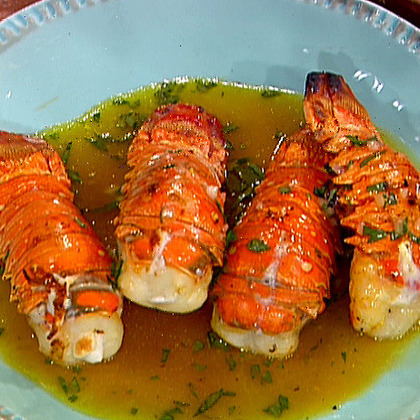 Serve lobsters as soon as they are grilled, drizzled with the vinaigrette.